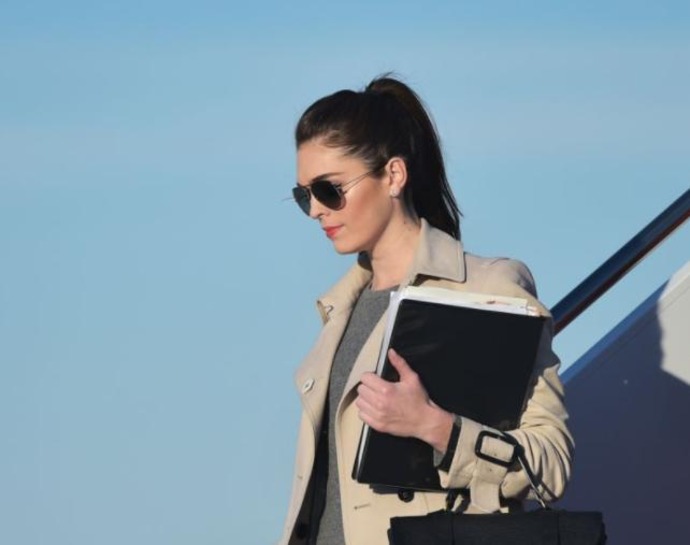 Aside from Donald Trump, the most powerful person in Washington isn't the VP, the first lady, or even the first daughter - it's Hope Hicks, the president's longest-serving aide. On Thursday, GQ magazine released a list titled "The 50 Most Powerful People in Trump's Washington" and White House communications director Hicks is ranked number one. The spots were based on a "Shades of Power" scale determined by degrees of "ascendant," "enduring," "precarious," "perplexing" and "surreptitious." Hicks' power status was deemed "perplexing." "Hope is feared and revered in the West Wing," Kellyanne Conway, counselor to the president, who did not make the list, told GQ. "To the public, she remains in the background. To the president, she is front and center." The 29-year-old who formerly worked in PR for Ivanka Trump's namesake clothing line, joined the president's campaign as press secretary after the then-candidate called her in for a meeting. "Mr. Trump looked at me and said, 'I'm thinking about running for president, and you're going to be my press secretary,'" Hicks told New York magazine in April 2016. "I think it's 'the year of the outsider.' It helps to have people with outsider perspective." According to the December book, Let Trump Be Trump, the president has referred to Hicks having "about as much experience as a coffee cup" but agreed that her good looks were a selling point. Although Hicks herself doesn't engage in social media, she does manage the president's controversial Twitter account and as Politico reported in July, "has earned the president's trust by letting him do just as he pleases when it comes to dealing with the press." The rest of the time, Hicks reportedly handles up to 250 media requests, solely determining which news outlet gets access to the president. Despite her tireless work ethic and ability to fly under the radar, Hopes has been a subject of public fascination. The former model who worked for Ralph Lauren and Bloomingdales has been regarded as a fashion icon from her sharp black tuxedo with satin bowtie, $798 Stuart Weitzman boots, and gorgeous youthful looks. Her love life has also been scrutinized, particularly her former relationship with former staff secretary Rob Porter who resigned in February following abuse allegations from his two ex-wives. And although she's managed to operate under the radar, in January, the House Intelligence Committee asked Hicks to testify regarding her role in possible Russian election interference, per The Hill. Hicks surpassed Ivanka Trump and Jared Kushner, who ranked #37 due to Jared's reported idea to fire FBI director James Comey, which triggered the Russian investigation and Ivanka's fall from grace as liberal game changer to scapegoat. Barack Obama scored 30th place due to taking up "a rent-free space in Trump's head" and outnumbering the president's Twitter following and network Fox & Friends landed at #13 because "more American presidents get their FBI conspiracy theories here than from any other source!" GQ did not return Yahoo Lifestyle's request for comment on why First lady Melania Trump did not make the list. However, Celebrity Big Brother castmate and former Trump aide Omarosa Manigault squeezed in at #50 in a category called "The Myriad Ghosts of Trump's Political Past."